Arturia made their name emulating classic synths, and then made their name again in hardware synths and handy hardware accessories. But they’re back with an original synthesizer in software. It’s called Pigments, and it mixes vintage and new together. You know, like colors. 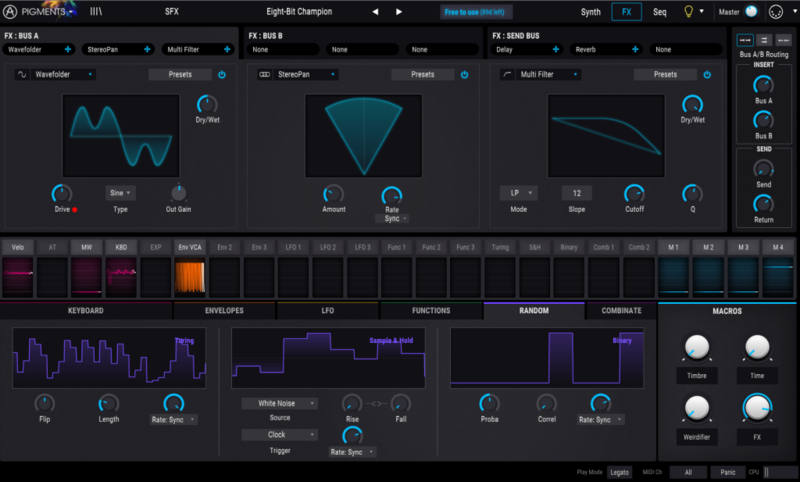 The funny thing is, wavetable synthesis as an idea is as old or older than a lot of the vintage synths that spring to mind – you can trace it back to the 1970s and Wolfgang Palm, before instruments from PPG and Waldorf. But “new” is about sound, not history. And now it’s possible to make powerful morphing wavetable engines with loads of voice complexity and modulation that certainly only became practical recently – plus now we have computer displays for visualizing what’s going on. Pigments brings together the full range of possible colors to work with – vintage to modern, analog to advanced digital. And it does so in a way that feels coherent and focused. Okay, so what’s under the hood that makes them claim that? 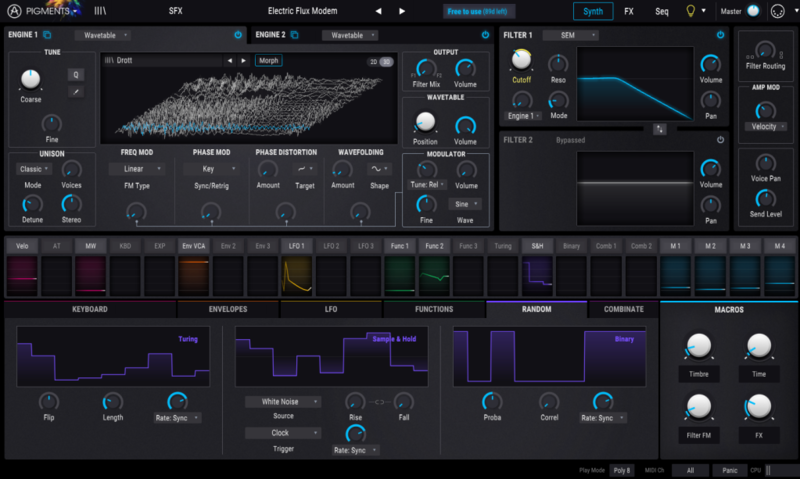 Two engines: one wavetable, one virtual analog, each now the latest stuff from Arturia. The waveshaping side gives you lots of options for sculpting the oscillator and fluidly controlling the amount of aliasing, which determines so much of the sound’s harmonic character. Advanced pitch modulation which you can quantize to scale – so you can make complex modulations melodic. From the modeling Arturia has been doing and their V Collection, you get the full range of filters, classic and modern (surgeon and comb). There’s also a bunch of effects, like wavefolder, overdrive, parametric EQ, and delay. There’s also extensive routing for all those toys – drag and drop effects into inserts or sends, choose series or parallel routings, and so on. The effects section is as deep as modulation, but somehow everything is neatly organized, visual, and never overwhelming. 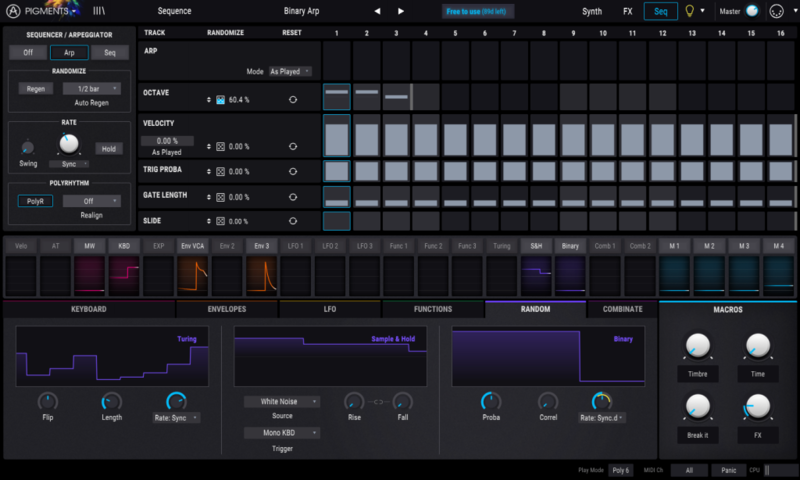 You can modulate anything with anything, Arturia says – which sounds about right. And for modulation, you have tons of choices in envelopes, modulation shapes, and even function generators and randomization sources. But all of this is also graphical and neatly organized, so you don’t get lost. Best of all, there are “heads-up” graphical displays that show you what’s happening under the hood of even the most complex patch. The polyphonic sequencer alone is huge, meaning you could work entirely inside Pigments. Color-coded and tabbed, the UI is constantly giving you subtle visual feedback of what waveforms of modulation, oscillators, and processors are doing at any given time, which is useful both in building up sounds from scratch or picking apart the extensive presets available. You can build something step by step if you like, with a sense that inside this semi-modular world, you’re free to focus on one thing at a time while doing something more multi-layered. Then on top of all of that, it’s not an exaggeration to say that Pigments is really a synth combined with a sequencer. The polyphonic sequencer/arpeggiator is full of trigger options and settings that mean it’s totally possible to fire up Pigments in standalone mode and make a whole piece, just as you would with a full synth workstation or modular rig. Instead of a short trial, you get a full month to enjoy this – a free release for everyone, expiring only on January the 10th. So now you know what to do with any holiday break. During that time, pricing is $149 / 149€, rising to 199 after that. I’m having a great deal of fun with it already. And we’re clearing at a new generation of advanced soft synths. Stay tuned.